Handcrafted from your choice of Oak, Brown Maple, Cherry, Quarter Sawn, Walnut, or Hickory, our Medium Sized BluRay/CD cabinet will complement any decor, while adding a neat storage solution for your media. 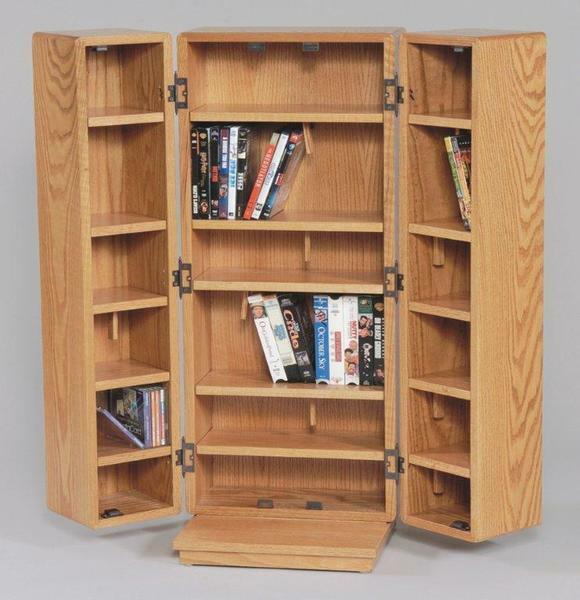 The solid wood design stands 42 1/2" tall, opening on both sides to reveal three spacious cabinets with sliding separators that will allow you to store your movies, games, and CDs in an organized way - allowing easy access when it's time to kick back and relax. The magnetic closures ensure the doors remain secured when not in use. Customize the wood, stain, and varnish of this media cabinet to complement your unique space and make it your own. Each cabinet is handmade and delivered to your home, crafted with skill and care to last a lifetime and enough integrity to hand down for generations. Call us today with any questions on our Amish made living room accessories. Our specialists are available and ready to help you furnish a home you will love. Can hold approximately 348 compact disks.